Daniel Cheng, managing director for Asia Pacific and chief representative in Beijing for Bennett Jones LLP, received the Governor General’s Medallion at a ceremony in Beijing on July 14. The award was presented to Cheng by Gov. Gen. David Johnston. 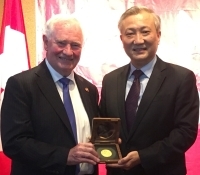 In a letter accompanying the medallion, the governor general noted that Cheng’s work “to foster a strengthened relationship between Canada and China is appreciated by so many. I am grateful to you for reinforcing the economic and business ties between our countries, which have allowed both our peoples to benefit economically. Thanks to your efforts and those of like-minded citizens, I have no doubt that Canada's ties in the region will continue to flourish." When presenting the award to Cheng — who is a Beijing-born Canadian citizen — Johnston noted that “R.B. Bennett would be very proud,” referring to the law firm’s founding partner who was prime minister from 1930-35. The governor general was on an official visit to China, from July 10 to 14, with stops in the cities of Chongqing, Guiyang and Beijing.